Epic was the lead off bull in the 2018 NWSS Grand Champion % Pen of 5 for Oak Meadow! 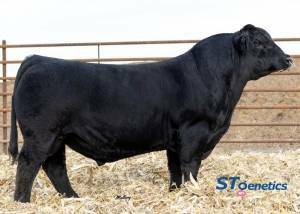 Epic was Schooley & Sears choice in the Denver Yards to add a purebred outcross sire. Epic comes out high in his neck and shoulders, stands on huge square feet, has flawless structure and has a powerful wide based build. Time and time again we hear you can't have power and high API: Epic E27's EPDs & phenotype are EPIC!